Hi Eric, I mostly agree with your responses. One might still be worried about the following: the way and context in which order effects are elicited is a very artificial one, and so I don't think it's all that clear how it translates into real-life philosophical thought experimentation. For example, we almost never consider several thought experiment cases in close temporal succession in our actual philosophical practice, free of any context or guiding philosophical questions. So even if this should be a real source of judgment-instability that even affects the relevant experts, it might be a source of instability that occurs so rarely under real-life, "ecological" conditions that we needn't worry about it too much. Thanks for that thoughtful comment, Joachim. I agree that the context is artificial, so it's not clear how it translates into philosophizing in the wild. 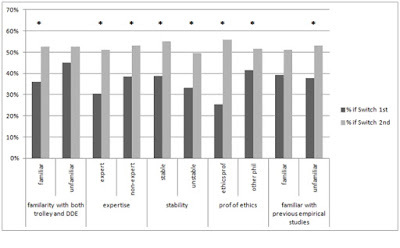 However, I do think that the results sit more comfortably with a certain range of metaphilosophical views (involving philosophers' susceptibility to unknown and unwanted influenced on their judgments) than with another range of views (involving philosophers having stable opinions in their areas of expertise which are relatively immune to unknown, unwanted biases). These results are only one piece of contributing evidence to a much larger picture on which we don't have a lot of systematic evidence, but on which people do have lots of informal impressions. Great to see another post about these articles. Two very strong things are concluded in the paper, namely to undermine prior results and an entire method of studying a phenomenon. I do not think it is appropriate to conclude these things on the basis of the fact that results are unexpected after relying on premises that, again to my knowledge at least, have not been shown. It is premature at this stage can risk corrupting the research record. The insight by Rini that familiarity could result in different tasks in the experiment is a valuable one and in some sense surely correct. Whether or not such differences are ultimately relevant to the present issue is a research question that requires data. It sounds like when minimal investigation into the issue occurred none was found. No doubt there's limits to self-report measures for this issue, but that evidence looms pretty large to me given the evidence for a problem initially. I have a question about this metaphilosophical conclusion: "If even professional philosophers' expert judgments are easily swayed by order of presentation, then such judgments might not be stable enough to serve as secure grounds for philosophical theorizing." But I gather that the ordering effects data is consistent with some of the subjects being reliably not susceptible to ordering effects. If so, and if some are resistant to ordering effects in this way, then what's the barrier to the moral judgments of these folks serving as secure grounds for philosophical theorizing? In other words, even if there is a statistical tendency for people to be irrationally sensitive to ordering effects, it doesn't follow that each person is sensitive in this way. Given this, and provided that one can tell that one isn't sensitive to these effects, then is there any objection from this study to the security of one's moral judgments? Slightly off topic : Metaphilosophical worries? Does Metaphilosophical==science? Wesley: I'm inclined to think that Rini's assumption has some initial plausibility, but I agree that it's an empirical question and the limited existing empirical evidence doesn't seem to support it. I would think/hope that at *some* level of expertise order effects would vanish. I wouldn't predict qualitative order effects (in equivalency ratings, maybe some scaling effects) for Frances Kamm or John Martin Fischer. But as Fiery and I note at the end, if there is a level of expertise at which they disappear, we haven't found empirical evidence of it yet. Paul: Right, our data are consistent with the majority of respondents NOT having ordering effects. It's tricky to know exactly what to do with this, metaphilosophically. There are two reasons to be concerned: One is that this is only a single manipulation. A respondent might not be subject to exactly this effect, but there are many other types of effects that are possible (e.g., actor/observer effects, racial bias effects, contextual effects due to one's interlocutor, mood effects, foul odors). If other measures also find substantial effects then unless it's the same few people who are subject to all of them, then it's plausible that the majority of respondents would be subject to some of them, and thus have unstable views. A second reason to be concerned is this: Say you accept that there's a 20% chance that your view is unstable. That's a minority chance, but even minority chances can be epistemically worrying, especially when one idea needs to be strung next to another next to another to get one's final conclusions. Unknown: I'm inclined to recommend dialogue rather than solitude. Callan: "Metaphilosophical" -- the philosophy of philosophy. I view philosophy and science as overlapping rather than as distinct. Thanks for the interesting discussion, Eric! I’ll try to say a couple things in reply to your comments on my paper. First, for those who haven’t read the paper, let me clarify what it claims. I’m claiming that professional philosophers are probably doing something different than ordinary people when they participate in these studies, and this fact makes it difficult to interpret the results. You can get the idea if you imagine the following: You see Peter Singer at a conference and you walk up to him. You say, “Peter Singer, is it ethically consistent to save a child drowning right in front of you but *not* contribute anything to alleviating global poverty?” It would be very very strange if Singer replied, “Hold on a moment, I’ve got to work out my answer to that question.” This would be strange because Singer has written about this question for more than forty years. He already knows his answer. He doesn’t need to generate a new answer each time the question is asked – he just remembers what he said every time before. My claim is that the philosophers in your initial study are like Singer in this story. They are familiar with the trolley cases you use as central stimuli. They have reacted to these cases before. It’s just strange that they would stop to generate *new* intuitions, rather than immediately report their memories of how they replied in the past. Note – IMPORTANT – that this point is independent of the hypothesis of your study. That is, the expectation that people would just report their familiar responses to familiar cases does NOT depend on affirming (or denying) any special reliability to philosophers’ intuitions. It’s just common sense. If your job involves teaching and defending a set of views you’ve taught and defended dozens of times before, you don’t need to bother generating those same views every time you think about them. That is my reply to concerns Wesley has raised here and elsewhere. I’m not floating some empirical conjecture about the underlying psychological machinery. My point about familiarity is extremely simple: experts in a domain are likely to use memory of past response (rather than novel response-generation) to reply to familiar cases. This seems hard to deny; I certainly think the burden of proof is on anyone who wants to deny it. So, if we grant my point about familiarity, then the results you report are perplexing. Presentation order shouldn’t matter to what people *remember* of their past responses to familiar cases. Singer is not going to give a different answer if you ask him about distant poverty before you ask him about the drowning child, because he already knows how he has always responded to each. And yet your professional philosopher subjects apparently *do* show order effects! The puzzle is: why? Why don’t they just report their memory of past responses? Why do they apparently generate novel intuitive responses (which are subject to order effects) rather than report memories (which predate the order manipulation)? In the paper I go through various explanations, which you helpfully summarize here. I agree with you that the first two explanations are unlikely. A combination of the third and fourth explanations seems most likely. That is, (3) some philosophers have never felt the need to form opinions about these cases, or reject any simple ‘permissible/impermissible’ answer, so when your study forced them to give something other than their familiar non-answer, they were subject to order effects. And (4) some philosophers have unstable intuitions about these cases, such that they have no *single* past reaction to remember, and so they are forced to generate a novel response, subject to order effects. My broader dialectical claim is that, if (3) and (4) are right, then it is no problem for philosophy if these people account for your data --- so long as they aren’t also the SAME people going around proclaiming that their own intuitions are distinctly reliable. (Importantly, your results do not show that *all* or even most philosophers are subject to order effects.) The data in your initial study is compatible with the possibility that people who claim stable and reliable intuitions were not subject to order effects, and those who do not claim stable or reliable intuitions account for the reported effects. That’s where your follow-up study, which I was very glad to see, comes in. You explicitly asked subjects about their familiarity with the stimuli and whether they think their reactions are stable. My worry here is about we interpret self-report. When you ask your participants whether their intuitions are “stable”, this doesn’t necessarily mean the same thing, out-of-context, as it does in the dialectical context surrounding the expertise defense. In my paper I used ‘diachronic stability’ as a technical term, which may or may not have the same application as an out-of-context use of the colloquial word ‘stable’. It’s usually not a good thing to self-ascribe “unstable” professional opinions, absent context. It is less of a problem to agree that, on certain topics, one does not always react the same way to a particular case – especially if the context makes clear that “unstable” views are fine so long as they are not conjoined to claims of reliability, or to philosophical practice that implicitly presupposes reliability. Basically, to get better self-report of stability, I think it needs to be made clear to participants that it is not necessarily a bad thing to admit to instability. In short, I’m not convinced that out-of-context self-report is sufficient to sort out the target population. What we want to do is look at philosophers who (a) make use of particular intuitions in their philosophical practice and (b) believe that those same intuitions are stable and reliable, in the relevant sense. If *these* people display order effects, then I agree that the expertise defense is seriously undermined. I have some more suggestions for how to get that data. But this comment is already long enough, so I’ll encourage interested readers to look at the last section of my paper! Thanks for clarifying all this, Gina! My guess is that Kamm and Fischer, and others who have published multiple articles on trolley problems, will not have unstable intuitions in the relevant sense. However, this guess is not yet empirically confirmed (and might be beyond realistic hope of confirmation). But another relevant group is their audience of expert readers, by which I mean the advanced graduate students and professors who might not publish on these problems themselves but who are the primary target audience of the articles. If these philosophers have unstable intuitions, in the relevant sense of "unstable", then the reception of work on the topic is subject to troubling influences. The reception is probably what matters most to the discipline (or maybe public reception is what matters most -- then then the case for instability is even stronger). One argument for this is to consider an extreme case: If everyone ignored Kamm, it wouldn't matter to the discipline what she wrote. I agree that there's a gap between the conclusions of this study and the conclusion that philosophers who determine the reception of philosophical work have unstable opinions that are open to a variety of epistemically troubling biases. For one thing, we only test two types of instability on a few types of cases. For another, as you point out, the context of an internet survey -- even one targeted toward professional philosophers -- is different from the context of reading a work and forming an opinion. A direct empirical test of the phenomena in question is not going to be possible. What is possible is plausibility arguments based on convergent evidence. Much of my career has been devoted to exploring various ways in which the factors driving philosophical opinion are not what expert philosophers think they are, and are epistemically suspect -- from my work on the unreliability of introspection (including how philosophers' opinions about the stream of experience seem to be shaped by media metaphors), to my work on implicit bias, to my work on cultural variation in philosophical opinion, to my work on the origins of philosophical views in developmental psychology, to my work on the shaky mix of cosmology and intuition that must be the epistemological basis of grand metaphysical theories. It all fits into a picture, of which this work with Fiery is one piece. I think it's very strange in the other direction in regards to not form a new answer each time. Or more exactly, to not form a new answer each time and to think that is fine and legitimate - that seems very strange to me. What if you are wrong? Then you're just repeating by rote learning an answer that is wrong. Indeed it'd go against the very grain of the notion of critical thinking - every time you were probed on a subject upon which another person thinks you were wrong, you'd end up just repeating the rote answer over and over again. I grant the practicality of not wanting to form a new opinion each time - it's a labour. What I don't get and find weird is treating it as legitimate to do so somehow, rather than "Yeah, I can't be bothered, though hey, maybe if I thought about it I'd find a new insight/find some way I'm wrong on the matter". There's probably already a study that's named a bias that assigns accuracy to a thought precisely for how much it has NOT been questioned/thought about. "I’m not floating some empirical conjecture about the underlying psychological machinery. My point about familiarity is extremely simple: experts in a domain are likely to use memory of past response (rather than novel response-generation) to reply to familiar cases. This seems hard to deny; I certainly think the burden of proof is on anyone who wants to deny it." That is a textbook case of an empirical conjecture about psychological processing. "Presentation order shouldn't matter to what people *remember* of their past responses to familiar cases." Maybe in some sense it shouldn't, but is there any evidence that memory is *not* susceptible to order effects? Clearly another empirical question. Based on what is known regarding the malleability of memory, I would not be surprised to learn to that it exhibits order effects. I still see no evidence for the two premises in the central argument of this paper, namely that philosophers use only memory when responding to certain thought experiments or that doing so is not susceptible to bias. I ask again, is any evidence offered for these claims about either mental processing or the nature of bias? I can also engage in a chain of speculation but for the opposite claim that the results are expected. For instance, we might expect more errors when people pay less attention to things. And we might expect people seeing the thought experiment for the first time to pay more attention to it than someone familiar with the basic idea and is just recalling a result from memory rather than thinking about it. Therefore according to this chain of speculation, the results obtained would be quite expected. Of course, we don't know if this chain of speculation is correct, which is why it would be important to test it before making claims on its basis about actual controlled experimental findings. Callan, John, and Wesley -- I was inclined to spot Rini those claims as a plausibility-based starting point, but clearly not everyone shares Rini's assessment here. To be fair to her, empirical work too, especially in relatively sparsely-studied areas, needs to start with plausibility-based assessments of, for example, what types of factors are and are not worth trying to control for, what Hypothesis A and Hypothesis B would reasonably be interpreted as predicting, etc. When the interlocutors disagree about what is initially plausible, as apparently here, that process breaks down and further work needs to be done -- as I think all of us including Rini agree about! Eric, I can see making or granting the assumption for this or that purposen. But I don't see how it could be construed as non-empirical or "just commonsense" or placing a special burden on someone who does not proceed by making the same assumption. My perception of the dialectic here is that Rini is assuming that familiarity would lead to stability as part of a plausibility argument that raises worries about my work among others, so in spotting it to her, I'm being charitable. I don't think my own work relies on it. Yes? Agreed, I don't see how your work would rely on it. Hey Eric, I agree empirical work must regularly make plausible assumptions when designing experiments. To me, the possibility of the claims we are considering being true seems like an excellent place to begin inquiry, in the form of designing experiments to test them. But the issue isn't whether the process of what interlocutors find initially plausible breaks down. The issue is that initial plausibility constitutes speculation that is insufficient to substantiate a chain of empirical premises for the purposes of undermining actual experimental findings. I am a firm believer in charitably interpreting arguments. But what I will not accept as a research practice, and I will stick to this, is dismissing a record of controlled experimental research, or broader aspects of research methodology, on the basis of inferences that depend on chains of highly unsubstantiated empirical assumptions. The conclusions made here go far past raising a possible worry, and I believe that is harmful to inquiry.